The page is designed for the students to keep track of each time they take an AR test. Students color in a square every time they pass an AR test and watch their progress grow. Use this handy tracking chart to display student goals and progress in the classroom for them and classroom visitors to see. A.R. 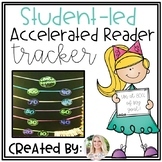 Accelerated Reader Monitoring and Tracking Pack! Help your students track their Accelerated Reader goals with these easy to use forms. Students can make point goals, word count goals, or page count goals and track their progress. Included are 4 quarters, 3 trimesters, 2 semesters, as well as two blank forms for writing in a specific date range. Have students keep track of their AR progress with this graph. Check out my AR Bookmarks too! I hope you find this useful! This sheet can be used by students to keep themselves on track with AR. They keep track of their levels, due dates, etc. Instructions on how to find book in their levels in included to promote independence. 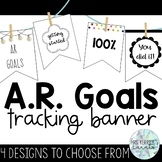 Help your students keep track of their AR point goal with this handy bookmark. As they race toward their goal, they shade in the percent of goal they have reached. To see how I use this product in my classroom, please visit my blog at www.mrslaffinslaughings.blogspot.com. This is a reading log that students can use to keep track of which books they have read and how many points they have earned on Accelerated Reader. The log can also be used as a data log for the teacher as a record of AR comprehension test scores and how long a child is spending on each book. Great for leadership notebooks and getting students started on tracking their accelerated reader progress. Students use this Accelerated Reader (AR) sheet to track their quarterly goals. I have them keep it in their data binders. It lets parents and students know where they're at with their goals. This is an easy to use form that I created to use to help students, parents, and teacher keep track of AR Goals. This is a Word Document so feel free to make it your own to fit your classroom needs.